Gen Xtinct: Gym, a.k.a. PE, Phy Ed, or even .... Phys Ed? There are two kinds of people in the world: Those who loved gym, and those who still shudder at the thought. You know which one you are, don't tell me you don't. High school gym for me wasn't terrible because I went to an all-girls school, and there just wasn't the major pressure I think there might have been at a co-ed school. Mostly we just stood around (volleyball, softball, I don't remember playing basketball) and hoped the ball wouldn't come our way, or moved around so we looked like we were getting some exercise and hoped the teacher wouldn't call us out. We didn't have a pool or a fancy gym--our gym was uber-basic and also contained the theater stage, which limited our moving-around space. And in Minnesota, there wasn't a lot of time when you could have gym outdoors. We were given matching gym shirts and shorts in high school, but seriously, the amount of sweating we did in gym was so minimal that absolutely zero of us took showers after gym, and I can't even remember if we took our gym clothes home often to get washed. I'd say we must have smelled horrible, but we didn't sweat a lot, so it's more than possible we didn't. It was the 1980s! We weren't very smart about things! 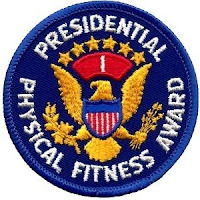 I vaguely remember the Presidential Physical Fitness Award, which apparently was changed to be called the Presidential Active Lifestyle Award. I would say I'm sure I never qualified for one, except that I think I HAVE one somewhere in a box of school crap, so maybe I did. No question that society as a whole is much more attuned to being fit and eating properly and all that stuff, and I imagine gym class is much better today than it was in the 1970s and '80s. I learned to like gym in college, when I could pick the electives I wanted (swimming!). But I imagine even if it is a more useful class today, it still stars in people's nightmares. What are your gym class memories? What weird games/sports did your school play? Did you have gym suits? (We never called them that!) Did you win a Presidential Physical Fitness Award? And what did you call it -- gym, PE, phy ed, phys ed, none of the above? Phys Ed (that's what we called it... never gym, never anything else) was a horrible experience. Jocks excelled and got a chance to show off -- for everyone else, it was an exercise in humiliation. We didn't have "gym suits," but since out school colors were blue and white, we were required to wear blue t-shirts and shorts (and if you didn't have them, you had to take phys ed in your underwear!!!) And as for showers, the only guys who took them were the big guys who liked showing off their junk; everyone else risked having their clothes stolen. If anything, phys ed succeeded in *discouraging* physical activity. If memory serves ( and this is dating back to fifth through 8th grade, mind you-- a long, long, long time ago) we had to throw a softball a certain distance; do a certain number of chinups and hold ourselves up in a fixed chin up position for a certain amount of time; run the 50 yard dash under a certain time and do a standing long jump for a certain distance. Am I forgetting anything? Now, ifIf we did everything as prescribed from the President's Council on these matters, we got a patch from the President. Mine were all from Nixon. Are they still valid??? Wow...I hadn't thought about this in years. Oh yeah and in my small, humble South Central Texas school system, it was ALWAYS P.E. I think I must be older than you. I'm 51; granduated from HS in 1977. I did have a Spirograph and a Spirofoil whicn if you remember, were damned impossible to paint. They came with these odd painting spatulas. Remember? Gael, don't forget we also had to do gymnastics (on the uneven parallel bars) at DH, plus we had to pick a partner and make up our own aerobics routine (to a song of our choice) and demonstrate it for the instructor.